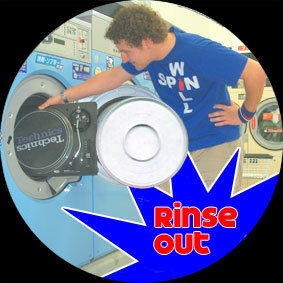 Rinse Out Mix CD by Will Spin: Stream Right click here choose save target as.. to save the file. 50mb, 1hr 13minutes. Mixed in July 2005. Physical copies are now sold out but it is available for download. More information. FM Fukui Interview: Stream Right click here choose save target as.. to save the file. 4mb, 8.43 minutes. Will Spin was let loose on FM Fukui. It consisted of an interview and a few tunes on "Dive Deeper" with Matsukawa Hidehiko on Wednesday 13th October at about 7:30pm. 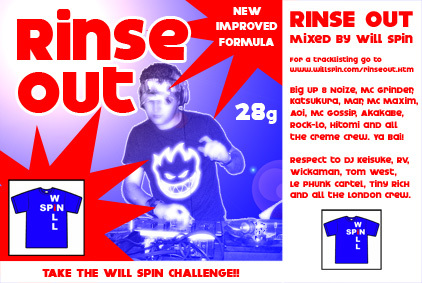 Will Spin rolling out some of the best tunes from his big red bag at the moment with MC Grinder and MC Aoi. This was a groundbreaking night for MC Aoi...it was her first blast at MCing over Drum and Bass. She did a fantastic job and blew away the Creme dancefloor. Big up MC Aoi. Highlights were the All that Jazz VIP remix, X Ray, Darth Vader's Imperial March and the killer Tarantula. Recorded live at Creme in Japan on 25 July 2005. Remember it's a live mix so please forgive the patchy sound quality..and the odd jumpy needle. MP3 Format 1:30 mins 62mb 96kbps. Right click here choose save target as.. to save the file. Last studio mix "Room 101" available by e-mail. The new Will Spin studio will be released very soon. Watch this space!